Smugglers tried to sneak Nike knock-offs past U.S. Customs and Border Protection officers at the Port of New York/Newark recently. 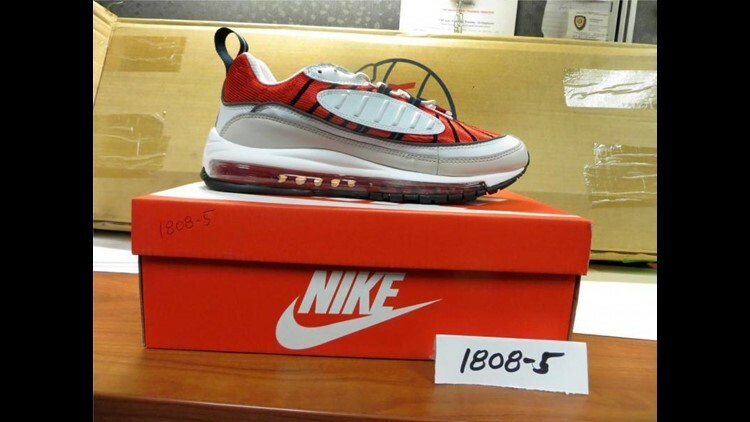 NEW YORK — Smugglers tried to sneak Nike knock-offs past U.S. Customs and Border Protection officers at the Port of New York/Newark recently. CBP said in a press release Tuesday that 9,024 pairs of counterfeit Nike sneakers were found by officers in late September. If authentic, the sneakers would have a MSRP of $1,695,600. Officers inspected the shipment after it arrived from Dongguan City, China. They submitted digital images of the sneakers to CBP’s Apparel Footwear and Textiles Center for Excellence and Expertise, the agency’s trade experts. CEE specialists worked with the trademark holders and determined the sneakers were counterfeit. The seizure was completed Thursday. The sneakers were supposed to go to an address in Chino, California. Immigration and Customs Enforcement’s Homeland Security Investigations agents in Newark, N.J., are continuing to investigate. The manufacturing of counterfeit goods robs legitimate businesses of revenue and American workers of jobs as well as poses health and safety threats to U.S. consumers. Oftentimes, CBP said, the proceeds from counterfeit merchandise sales supports other nefarious and illicit businesses.